Race2Raise team member Heidi O'Neil shares her personal connection to Dare2tri's mission. Heidi ran the Chicago Marathon on October 8, 2017. 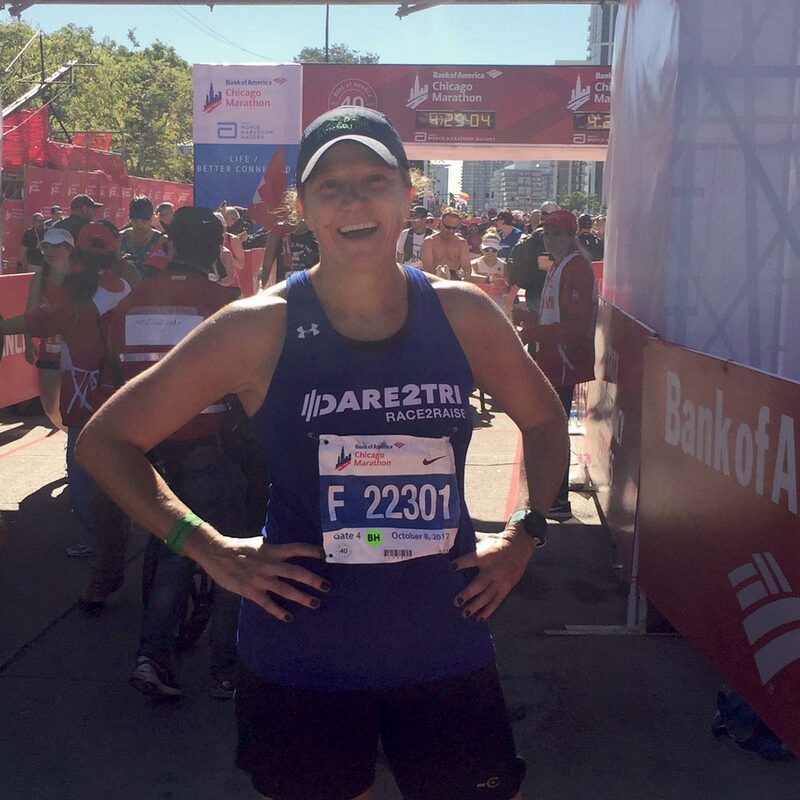 Check out her story below to learn why she ran for Dare2tri. Her story will inspire you. They returned that evening and Jack had a fire in his eyes. They told me they had met the triathlon world-champion, Melissa Stockwell. She had told Jack he was going to be a champion someday and he chose to believe her. Jon said that Melissa and her fellow Dare2tri co-founders saw Jack’s struggles and wanted to help him. I was very doubtful because in the previous months many people had offered to help, but nobody ever really did come through on their offer. Imagine my surprise the next morning when I woke up to two emails, one from Melissa and the other from Dare2tri director, Keri. The next few weeks were a whirlwind of appointments with a new prosthetist, a running blade, a kids’ triathlon camp, and Jack’s first triathlon finish line! Over the past 4 years, that first finish line has turned into many inspiring and triumphant finish lines for Jack. On October 8th, I get the opportunity to run the Chicago Marathon on Dare2tri’s Charity Team. How fitting that I am being coached by Melissa Stockwell, who has a knack for showing people their own potential and encouraging others to dream big. I am asking for your support. All of your donations will go to Dare2tri and benefit disabled athletes as they pursue the sport of triathlon and personally develop as athletes and human beings. As disabled athletes pursue the triathlon finish line, they soon discover that the courage of making it to the start line is equally as important as the triumph of crossing the finish line. The process of start line to finish line brings on feelings of self-worth, confidence, pride, and emotional healing. Moms like me get to witness moments of joy that contribute to our healing as well. From the bottom of my heart, thank you for supporting me and giving me the opportunity to thank the life-changers (and savers!) at Dare2tri paratriathlon club.